Thank you for visiting Walter Stephens Online. The number One Jail Supplier in the nation! 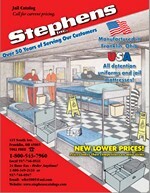 Walter F. Stephens, Jr., Inc. was started in 1960 by Walter F. Stephens, Jr. The company originally sold badges and officer uniforms. We continue to be a leading badge dealer.In the 1970's, the company expanded into Institutional Supplies for jails nationwide. The institutional supplies along with the badges have become the mainstay of our business. We manufacture jail mattresses, shower curtains, pillows, mattress covers, detention clothing, and institutional cigarette lighters at our premises right here in Franklin, Ohio. We are a U.S. Manufacturer and a Woman Owned and Operated Company. We also are a supplier of jail supplies which include hygiene items, blankets, linens, laundry bags, kitchen items, underclothing (men, women, and juvenile sizes), t-shirts & shorts, outer clothing, nightwear, inmate shoes and sandals, games and personal supplies, restraints, suicide bedding and garments, storage containers, bunks, and janitorial items. We are still a leading Blackinton badge dealer, lapel pins and Pocket Identification Badges. Walter F. Stephens, Jr., Inc. strides to keep costs down while supplying quality products. Our goal is customer satisfaction. We are members of the National Sheriffs Association, American Jail Association, and National Juvenile Detention Association. Copyright StephensCatalogs.com. All Rights Reserved.